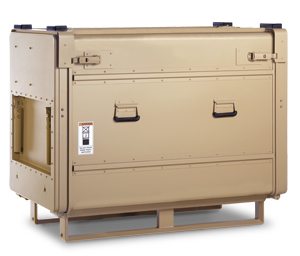 The one-of-a-kind ruggedized design of the Sterilucent PSD-85 Hydrogen Peroxide Sterilizer allows the unit to travel without damage, by any means necessary, and be operational within hours of arrival. 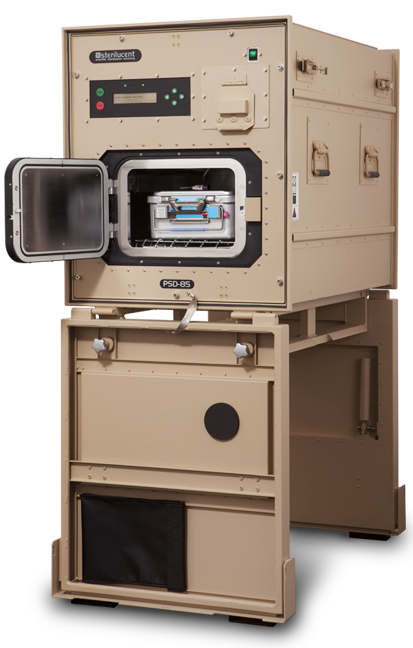 The PSD-85 system is a low-temperature sterilization technology that offers expanded material compatibility, particularly for temperature- and moisture-sensitive items that cannot be steam sterilized. In addition, the sterilizer's peak energy demand is similar to that of a hand-held hair dryer—only 1650 watts. Another important feature is its unique in-chamber sterilant concentration monitoring technology, which maintains the concentration of sterilant in the chamber above a predetermined minimum level required for sterilization of the load. This provides an additional aspect of sterility assurance for the process. Each cycle is also verified with a cycle-specific process challenge device (PCD), which is designed to emulate the most difficult to sterilize item in each pre-programmed cycle. Together, the sterilant concentration monitor and cycle-specific PCDs provide an unmatched level of assurance for Sterilucent PSD-85 sterilizer performance.